Brian Boyd’s article gives a very positive view of Scottish education today and suggests that it can be improved by copying the Finnish system. No evidence is produced for these views and many – inside and outside the system – would disagree totally. With regard to primaries, the Literacy Commission of 2009 concluded that 13,000 pupils (18%) left primary without being functionally literate. This has a huge impact on attainment in secondary schools, where Gerry Hassan has spoken of ‘educational apartheid.’ In a number of secondary schools, there is a full time police presence, something that would have been unimaginable 50 years ago. Parents spend tens of thousands of pounds to buy a house in an area that guarantees access to a successful school. Employers, including the universities, routinely bemoan the qualities of those emerging from our schools. Brian Boyd goes on to say that the right to choose a school ‘has to go.’ It is clear that he means that for poor families this right will have to go. Prosperous families, including – for example – teachers, will still be able to buy access to a successful school. At present a vast number of parents use this right. An analysis of Edinburgh primaries showed 15 where fewer than half the pupils allocated to the school attended. Nearly all were in the poorer areas of the city. In the city’s secondaries about 20% of pupils opt out of their allocated schools. Andreas Schleicher , Deputy Director of the OECD said recently that ‘your education today is your economy tomorrow.’ Following from that, today’s economy is a reflection of yesterday’s education system. It is an economy with a huge number of NEETS, low levels of skills and young people unable to compete with immigrants from Eastern Europe in the labour market. When recommending that Scotland should copy Finland, he ignores the fact that the head of Finnish education described their model as ‘unexportable’, due to Finland’s unique culture. Similarly, he does not look at the detrimental effect that moves in the ‘Finnish direction’ have had on Welsh education, a system vastly closer to ours culturally. Finally, Brian Boyd fails to confront the dysfunctional management at the top of Scottish education today. Lindsay Paterson has described CfE as vacuous and dishonest. None of this seems to have registered with Professor Boyd. 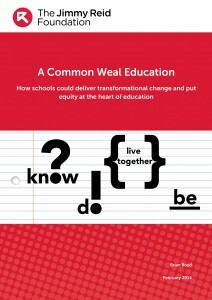 There are noticeable parallels between the educational establishment and that of other failed Scottish institutions. There is the same blinkered assumption that things are going well even as the evidence to the contrary reaches Munro heights. It is a pity that, on the issue of the future of Scottish school children. the Reid Foundation fails to embrace genuine radicalism.